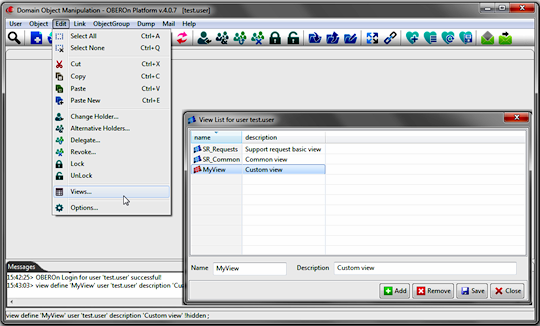 In previous lessons we have seen how to define the context of an OBEROn application and create the user menu. In this chapter, we will define other two basic elements for each OBEROn application: the form and the view. Forms are basically applied to single object / link instances while views have a table structure and can manage multiple instances as result of a query or a navigation. The forms can be of two types: those viewing / editing data and those for the selection of filters for searches. Moreover, a form can be applied to objects or links and in these cases it can be used to create new instances or to manage existing ones. The form defined in OBEROn are generic: their actual implementation depends on the detalied level of user interface. For example, in a web application the form should have a render that fits the context of a web page, while in a desktop application, there will be an engine to make rendering for the used graphical format (for example the eclipse SWT) and the same in a mobile application. Users enabled to manage Forms (see user access rights ) can create a new form instance by clicking the "Add new Form" button from the "Context Design" menu and compile the relative information. - the format - is a field where you can introduce optional information to describe the form format; the usage of this field depends on the application's rendering engine. For example, you can define here the default dictionary section where search the label translations or the form style or other custom parameters. The wizard pop-up will help you to compile this field setting the more common options. - the range program - is a program used to compute the list of values for the form-items. 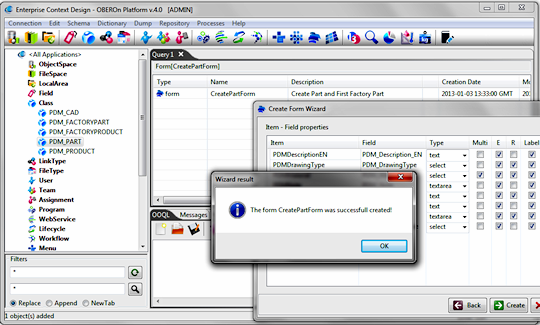 For example, when a form item represents a selection control, the combo options are automatically loaded by executing this program. The same program is executed more times, for each item that requires the computation, so you have to write a program code where the result depends on the form-item (or field) name passed as input. - the filter parameters - the item visibility depends usually on the object current stage or other object's parameters; with these options you can indicate a list of object's parameters (or the Object_GetBasicOption syntax without the brackets), used to determine if a single item will be showed or not. Indicating the dependencies into this field avoids to recompute the object's parameter values for each item inside the "item-visible " trigger. - the check program - this program checks the form item values before submit the form. Receiving the values from the framework's environment, the program can examine their validity. 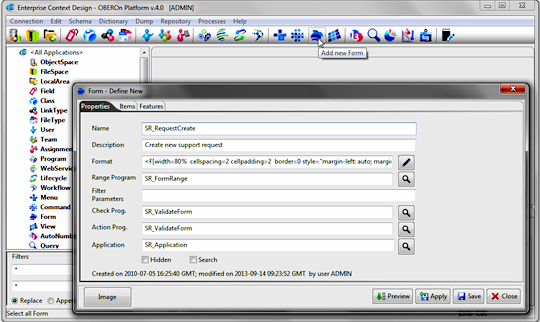 - the action program - this program performs some actions after the form is submitted (used for example to create and connect additional objects or to send notifications). - the search flag: when it is active, the rendering engine considers the form as a set of filters for a database query. basic The item is connected to an object/link basic parameter (like class, name, description, currentstage, linktype ...). When the item is editable you can create new object/link instances setting the basic properties or edit/change these properties for existing ones. field The item is connected to an object/link field. When the item is editable you can set/change the field value. xfield The item is connected to an extra object/link field. When the item is editable you can set/change the field value. This kind of filelds is used to define a unique form for creating multiple objects and connect them togheter by an action program. action Action input; is a parameter not directly linked with object/link properties, but can be used inside the form to determine other properties like basic or field values. It can be used also inside action / range / check programs to set a specific form's behaviour. hidden Is a hidden parameter with a fixed value. Very useful in the object creation for setting fixed parameters like the objectspace, the class, the autonumber and so on. A button bar starts with a special "button" item with button text equals to "<BAR>" and ends with another special "button" with button text equals to "</BAR>"
Navigation table: navigates the object with given parameters and presents the list of connected objects. You can apply a view to the list to show some specific properties and activate some action buttons to create, connect, disconnect and delete object in the list. form Include another (sub) form. This is very useful when you have a class hierarchy and the sub-classes introduce additional object fields: by creating a main form you can define sub-forms only for these additional fields. 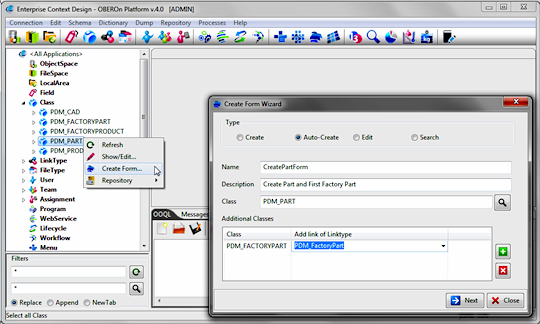 The platform will select the sub-form automatically on the base of the object class. on/off switches that may be toggled by the user; they are mutually exclusive: when one is switched "on", all others for the same property are switched "off"
hidden hidden control. This control can receive the value from the page request, or change the value on the base of other controls. - width and height/lines - are the horizontal and vertical dimensions; not all the item types and the control types support these properties. Some controls like "select" and "textarea" consider the height as the number of visible lines/options. 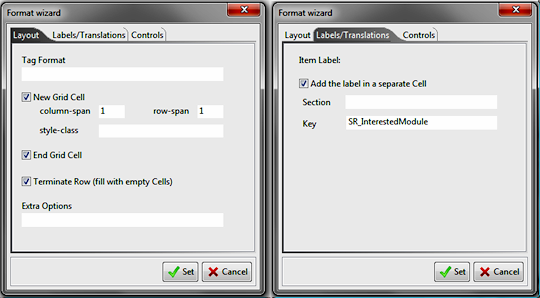 - multiple - is supported only for select controls and establish if you can select multiple options. - format - is a field where you can introduce optional information to describe the item format; the usage of this field depends on the application's rendering engine. You can use the wizard to set the appropriate value for this field. - item value - its meaning depends on the item type: for "basic", "(x)field" and "action" it represents the Basic Name, the Field Name and the Parameter Name respectively; for the "get", "getlink", "navigate" represents the OOQL expression to compute the value or the object list; for "section", "button" and "label" it is the showed text; for "href", "img" and "embed" it is the (source) URL; for the "hidden" type is the fixed value passed for the hidden parameter. - the Layout tab allows to set the main properties like the HTML layout or the tag format; in particular everything you write into the tag format will be reported into the html tag, for example you can set here the html tag attributes "style", "class", etc. For the "navigate" type, this option represents the view name applied to present the navigation result. The other options let you to create the form layout adding the <td> </td> </tr> html tags before and after the element. 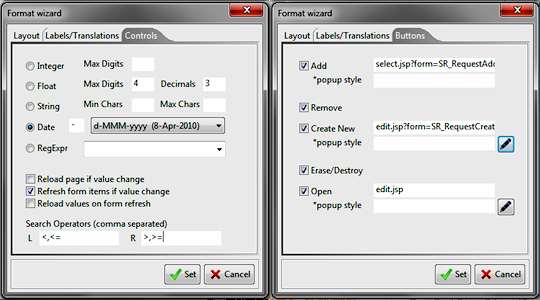 - the Labels/Translations tab can be used to specify the dictionary key and section (if not specified will use the form default) for the label translation. You can also indicate if this label is or not placed into a different table cell. 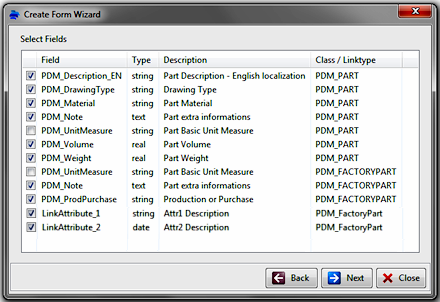 - the Controls tab defines both the item output format and the input format in case of editable control. In particular, you can set the limits for integer, float and string values or set the date format for the date type controls. These settings are important during the form's pre-validation. ° Reload page if value change, this means that every time the user acts on the control and changes the value or the selection, the page including the form will be reloaded and all other control values refreshed. This is useful when you need to show or hide some items on the basis of the item value. ° Refresh form items if value change, this means that when user change the control value, the other sensible controls will be refreshed without reloading the page. ° Reload values on form refresh, this defines the control "sensible": its value or the list of possible values will be reloaded when another control causes the form refresh. The search operators can be applied to "text" and "date" controls; if you specify the left (L) [and the right (R) operators] the user will be able to define a range for a search filter. The operator should be separated with comma: for example if you set [==,>=,>] for the (L) and [<,<=] for the (R) the user will be able to select blank, ==, >= and > in the first selector (low limit) and blank, <, <= in the second (high limit). - the Buttons tab is enabled only for the "navigate" type and let you to choose which buttons will be showed and their related click actions. The last important aspect we have to focus is the item visibility and/or the item access. We don't want to create a form for each condition or for each user role; the same form can be applied for several usages even if you have to introduce little changes to support different users and system conditions. 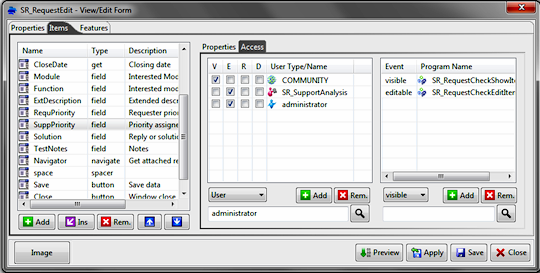 OBEROn lets you to control each form-item visibility/access simply defining access rules for it. First of all you can set if an item is visible (V) to all users and if it is or not editable (E), required (R) or disabled (D) for everybody. The community flags let you to specify these conditions. Moreover, you can set the access (V,E,R,D) for specific users / teams / assignments; the result for the current user is the logical OR of all conditions (community OR user itself OR team membership OR user assignment ). Finally, if this is not sufficient you can define the "visible / editable / required / disabled " programs to check the visibility, the editability and the other options. 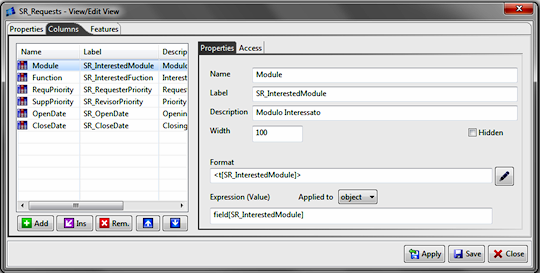 These programs receive, as input arguments, the filter parameters declared in the form properties panel and all the form's current values (set by the user and stored inside the framework environment). They work in negative logic: they can perform all system queries needed for the checks and can raise exceptions to disable a particular condition. For example, if you want disable the editability for a specific field, you may activate the editable flag for the community and define an "editable" trigger: when the program fails depending on a particular situation, the field will not be editable for the current user. Forms are dinamically created at the high level of the user interface on the basis of the definition made inside the generic level. The Preview tool simplifies the work for administration users because they can immediately verify how will be the general look, the position of fields , the validation checks and if field values are loaded correctly. Moreover, it is possible to test the localization by selecting the language among those defined into the dictionary. Creating a new form can be an annoying activity specially when the form is used to create or edit object instances and you have to define items for each object-class field. 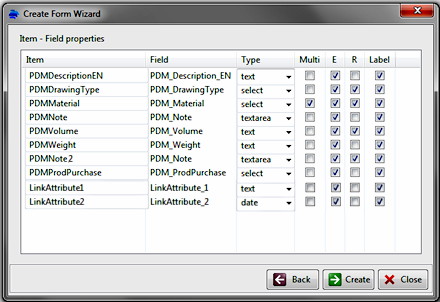 The form wizard helps you to create faster this kind of forms (they are the majority): from the navigation tree select the class of object to manage, right click on it and select "Create Form..". 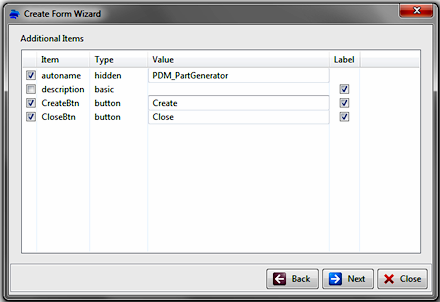 This action will open the form wizard tool; here you can specify the name and the type of form to generate (create new object for this class, create with autonumber, edit object instances or search for this kind of objects) and also set a description for the new form. In addition, you can define a more complex form where in a single user interface mask you put fields of secondary classes in a way that, at the same time, on the form submit action, you create instances of main and additional classes and connect them togheter with the specified linktypes. 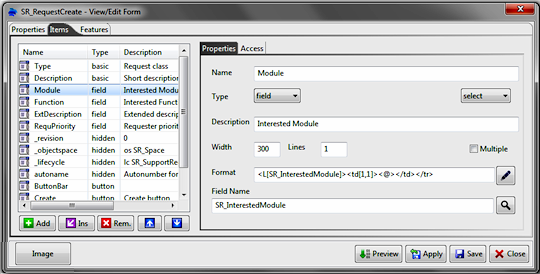 The second panel lists the fields for the main class, the secondary classes and the fields for the specified linktypes. Here you can choose the item to put inside the form. 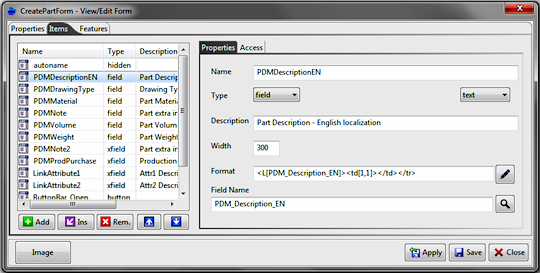 Finally, in the last panel you can specify main properties for each form item: the item-control type, the editable (E) and the required (R) condition, the multivalue option. The generated form is ready to be used in a web or a desktop application; secondary class fields and link fields are created as "xfield" items. You can move the items up/down to define the correct order or organize the layout (all items are placed by default on a single column). - create / auto-create forms: generate the object instances of secondary classes, set up their fields, add connection of specified linktype between the main class object and them, set the link fields for the new links. - edit forms: retrieve the object instances of secondary classes connected with the specified linktype, update the object and link fields for them on the base of input values. A view is substantially a table header: it defines a set of columns in a specific order used to show or edit properties for multiple objects. A view can be general or created for a single user: general views are defined in the "Context Design" console and they are common to all users for some application purpose. At the contrary, a view created by / for a single user is visible only for him. The view defined in OBEROn are generic: their actual implementation depends on the detalied level of user interface. For example, in a web application you can use tools like displaytag for creating the table structure based on the view definition and in a desktop application you can instead display the view structure by using the SWT Table / Tree widgets. 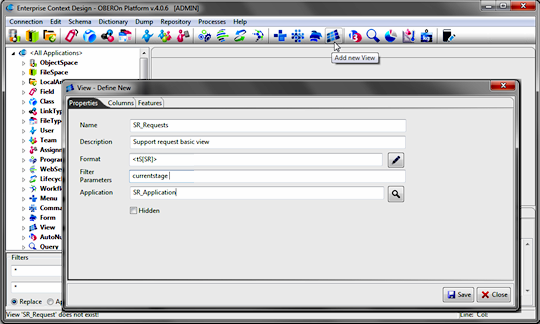 Users enabled to manage general purpose Views (see user access rights ) can create a new view instance by clicking the "Add new View" button from the "Context Design" menu and compile the relative information. - the format - is a field where you can introduce optional information to describe the view format; the usage of this field depends on the application's rendering engine. For example, you can define here the default dictionary section where search the label or data translations or the view style or other custom parameters. The wizard pop-up will help you to compile this field setting the more common options. - the filter parameters - when the view is used to show navigation elements, the column visibility may depend on the root object (generally the current stage or other object's parameters); with these options you can indicate a list of root object's parameters (or the Object_GetBasicOption syntax without the brackets), used to determine if a single column will be showed or not. Indicating the dependencies into this field avoids to recompute the object's parameter values for each column inside the "column-seeable " trigger. Custom views can be created in the "Domain Object Manipulation" console by selecting the Edit/Views.. menu command. If the logged user is enabled to manage general purpose Views he can edit here also the common views, otherwise, it will able exclusively to create / remove and edit its own views. - label - it is the column title; it is visible in the table header and generally it is translated through the dictionary, according to the dictionary section defined in the view's general format. - width - it is the minimal column width but this value can be ignored in the rendering process. - hidden - when this flag is activated, the column will be hidden for all users; the low level user interface computes the column values anyway and the mechanisms for hiding the column must be implemented at the high level UI. - format - is a field where you can introduce optional information to describe the column format; the usage of this field depends on the application's rendering engine. You can use the wizard to set the appropriate value for this field. - expression value - it represents the OOQL expression to compute the columns values for displayed objects. The expression can be applied to the object or to the link when the data are derived from a navigation process. If you apply the view to a query result, the columns related to link expressions will be discarded. 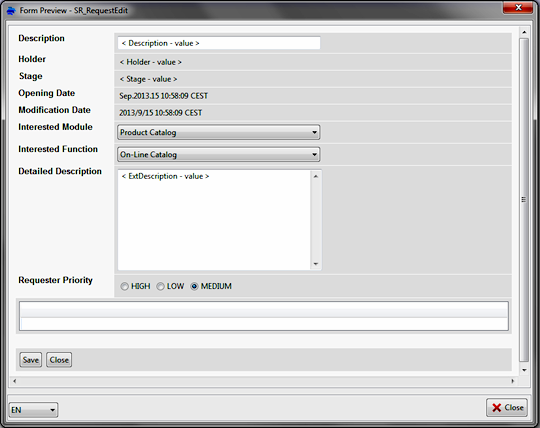 The last panel allows to define access rules for the column visibility and for the faculty of apply modification to the displayed data. We don't want to create a view for each condition or for each user role; the same view can be applied for several usages even if you have to introduce little changes to support different users and system conditions. First of all you can set if an item is seeable (S) to all users and if it is or not modifiable (M) for everybody. The community flags let you to specify these conditions. 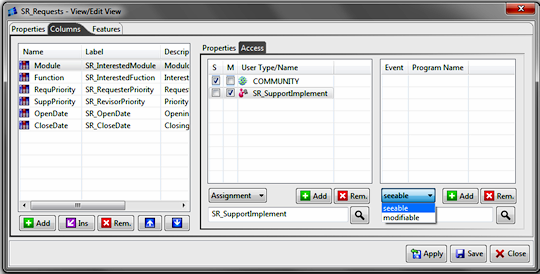 Moreover, you can set the access (S,M) for specific users / teams / assignments; the result for the current user is the logical OR of all conditions (community OR user itself OR team membership OR user assignment ). Finally, if this is not sufficient you can define the "seeable / modifiable " programs to check the visibility and the editability access. 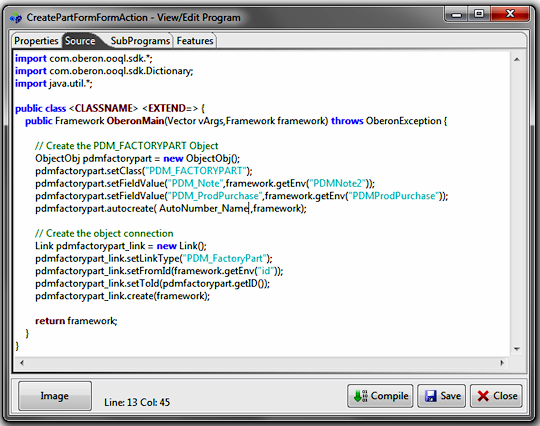 In case of navigation of a reference object, these programs receive, as input arguments, the filter parameters declared in the view properties panel (the values are computed for the root element). The access programs work in negative logic: they can perform all system queries needed for the checks and can raise exceptions for disabling a particular condition. For example, if you want disable the visibility of a specific column, you may activate the flag for the community and then define an "seeable" trigger: when the program fails depending on a particular situation, the column will be hidden for the current user.